Cookbooks? I have a few. Around 700 or 800 on the bookshelves in the sitting room. About 50 piled high on the windowsill next to the kitchen table. And there’s another 30 or so smaller paperbacks on the shelves by the back door. Not to mention the stacks that I’m currently cooking from at any one time. When I want to know how to cook polenta, I turn to Marcella Hazen’s Essentials of Classic Italian Cooking, A New Book of Middle Eastern Cooking by Claudia Roden is frequently used in the summer, French recipes come from Elizabeth David and Julia Child. New Zealand is well represented, as is China, India and George Lang’s The Cuisine of Hungary is somewhere in the kitchen. Visiting Hanoi, I brought Koto: A culinary journey through Vietnam home with me, a book on Slovenian cooking travelled to Cork with my father from a trip in Eastern Europe and last time I met my aunt in Kuala Lumpur she presented me with a book on Malaysian cooking. A lot of books and a lot of different cuisines. But, until now, nothing on the cooking of Western and Eastern Africa, which is why I was so excited when I got my hands on a review copy of The Groundnut Cookbook (Michael Joseph) by London-based Duval Timothy, Folayemi Brown and Jacob Fodio Todd. The trio started a pop-up supper club back in 2012, introducing an appreciative audience to the joys of green soup, chickpea egusi and fresh turmeric red lentils scooped up with injera pikelets. Taking inspiration from Kenya, Sierra Leone, Tobago, Nigeria, this food is fresh, exciting and – most importantly for those of you who, like me, live in rural Ireland – there aren’t too many difficult-to-source ingredients. The book is a series of menus, telling the story of the supper club, each starting with an aperitif and including recipes for meat and vegetarian mains, snacks, side dishes and something sweet. An index at the back of the book also categorises the recipes in a more user-friendly way. The dishes are both simple and achievable, from a new way to drink juice from an orange, edible fruit bowls made from biscuity sweet pastry, Yorkshire puddings topped with mango curd and Jollof rice. For now, we’re stuck on the delicious dish that gave the supper club and book its name: Groundnut Stew, a fusion of chicken, tomato paste and peanut (groundnut) butter, spiced with pepper and a Scotch bonnet chilli. Easy ingredients to find and – like many of the recipes in this book – so much more than the sum of their parts. The Groundnut Cookbook by Duval Timothy, Folayemi Brown and Jacob Fodio Todd is published by Michael Joseph. Thanks to the publisher for the review copy. You’ll easily find a Scotch bonnet pepper in those supermarket packs of mixed spicy chillies. When adding it to the pot, stab it with a knife to release flavour without so much of the heat. Try to get peanut butter with as few ingredients as possible. The original recipe specifies smooth, but I like texture, so used a crunchy variety. Serves 4-6. Any leftovers are even better on day 2. In a large bowl, mix the chicken pieces with the salt, black and white peppers. Heat 3 tablespoons of oil in a large frying pan over a medium heat and brown the chicken on all sides. Add the Scotch bonnet pepper, pierced with a knife, to the chicken in the pan. While the chicken is browning, dice the onions and finely chop the garlic. When the chicken is almost browned, add half the garlic and fry briefly. Remove the chicken and garlic from the pan and put to the side. Add 2 tablespoons of olive oil to the same pan, along with the diced onions. Increase the temperature slightly and fry for 10-12 minutes until the onions are soft and brown. Turn the heat back down to medium, add the rest of the garlic and the tomato puree. Fry for 5 minutes. Add the peanut butter, stir well, then whisk in the chicken stock. Return the chicken to the pan and cook over a low heat for about 25 minutes until the chicken is cooked through and the sauce has reduced slightly. Serve with rice or millet and a big bowl of crunchy salad – I went for shredded broccoli, cabbage, mango and lime. 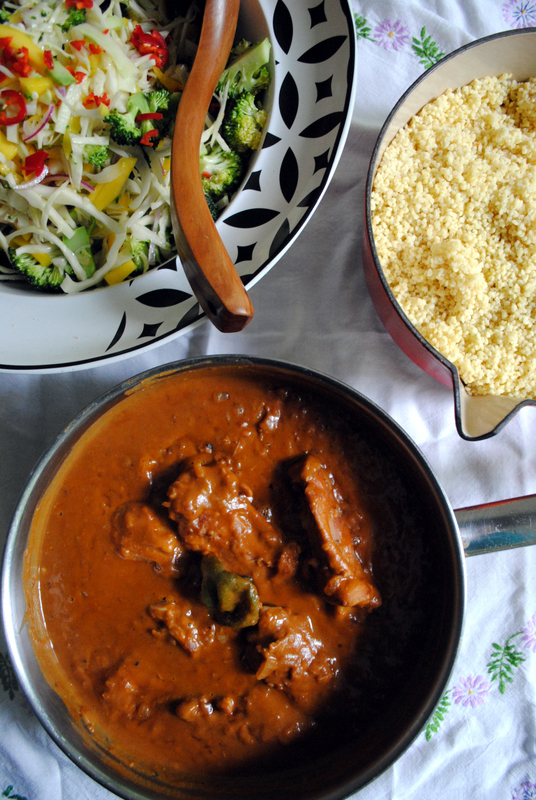 Adapted from The Groundnut Cookbook. This weekend sees the annual GIY (Grow It Yourself) GROW Fest, a celebration of growing, cooking – and eating! – which takes place at the Harvest Festival in Waterford on Saturday 12 and Sunday 13 September. Get a ticket for the weekend’s talks, with Joanna Blythman, Susan Turner, Jim Cronin, and Alys Fowler, in the GROW tent here. I’ll be MC-ing the COOK tent in Arundel Square, with free demonstrations from Darina Allen, Rory O’Connell, Lilly Higgins, Chef Adrian, Gaby Wieland, Tom and Johanna Doorley, Pip & Pear and Mark Diacono. Download the entire programme from the GIY website. Previous story What’s in your lunchbox? Pumpkin and feta tortilla!